I was at the liquor store the other day and one of the clerks just received a brand new beer I've never heard of before - Blanche de Namur by Brasserie du Bocq out of Belgium. As someone who became a beer geek thanks to witbiers back in mid '00s, I didn't even think twice about buying the beer. It's been a while since I've done a review, but due to work and vacation.. and lack of desire.. I just haven't written anything for the past month, so I've been pushing myself to review this all day today. 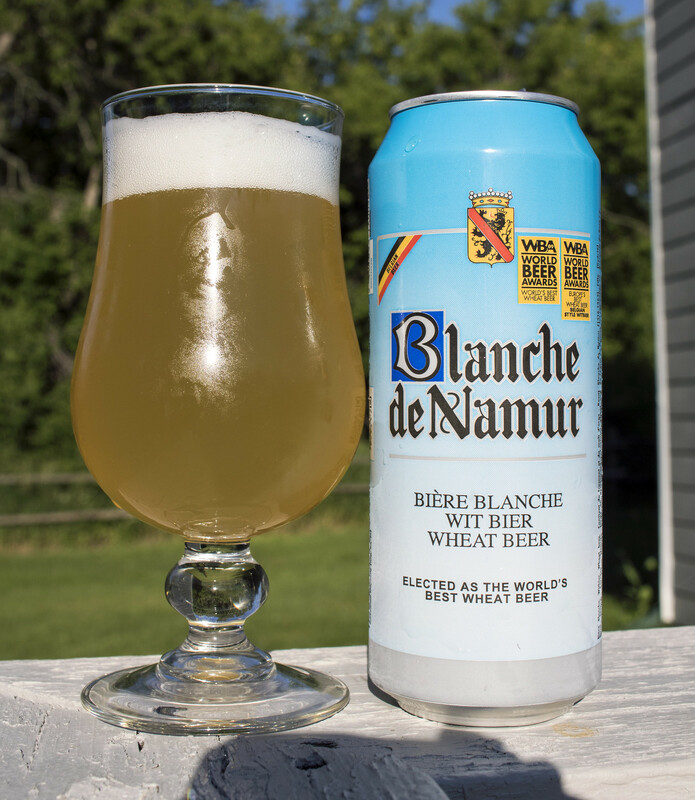 According to the label, Blanche de Namur was elected as the world's best wheat beer according to the World Beer Awards in 2009 and 2012. I've seen mediocre Canadian beers win gold at the WBAs in the past so I don't know how solid the designation is, but we'll find out if I like it in just a moment! Appearance: Pours a hazy, lemon yellow beer with a good amount of snow white head on top, light amount of carbonation. Aroma: Coriander is pretty much the dominant aroma here - it's popping up in every sniff. There's a moderate amount of Belgian yeastiness, a hint of graininess and good deal of orange zest. Taste: Coriander and orange peel followed by a light yeastiness, a hint of lemon, a light amount of spice, and a light hint of straw. Overall Thoughts: World's best wheat beer? No.. the coriander is a bit too overpowering for me, but it's definitely a tasty witbier that pairs well with hot summer weather and doesn't require a wedge of orange to be enjoyed. The coriander is strong enough that it lingers on my palate for a while. Easy to drink, citrusy, lightly spiced.